Our WordPress Plugin allows you to quickly and easily link your WordPress powered website(s) with Administrate. You will then be able to display upcoming Events and Course information, receive online course bookings, send automatic invoices and receive instant payments from your customers. By having this link between your website and Administrate, you also remove the need to duplicate data entry whenever your Course or Event details change. When displaying Course dates, as defined by Multi-session Courses, you can hover over the dates to view the sessions. This will allow the user to clearly see which dates the sessions will be held for that Event. Administrate will periodically make updates to the WordPress Plugin to add features and fix issues that are identified. Notification of these updates will be included in weekly release notes emails sent to Administrator users of your system. Administrate highly recommends that you do not customise the Administrate WordPress Plugin code, and Administrate cannot support any instance of the plugin that has been customised. Please note that when installing an update to our WordPress plugin that any unsupported code customisations will be overwritten. Within the Administrate Application you’ll need to create a Web User set up for API access. The username and password that you specify for this API user will be entered into the WordPress Plugin. This will then connect your Administrate database with your website, so that it can display your data. Please disable all other plugins in your WordPress Admin Panel prior to configuring the Administrate WordPress Plugin. This is to ensure that the Administrate WordPress Plugin is working as intended. Once it is working, please turn your other plugins back on one at a time, with each time verifying that the Administrate WordPress Plugin still works. If it stops working there may a conflict with the most recent plugin turned back on. Also see our list of known conflicting plugins . Here you will set up your Administrate WordPress Plugin to retrieve data from our demo database. This will show that the Administrate WordPress Plugin is working, before switching it to Live Mode , which retrieves data from your instance of Administrate. Click Administrate in the WordPress Panel and select the API tab. We recommend leaving the service mode as ‘Demo’ to use our demo database for testing. Once you’ve got Course and Event information pulling from our Demo Mode , follow the instructions below to switch the Administrate WordPress Plugin to Live Mode, which will pull data from your own Administrate database. Click Administrate in the WordPress panel and select the API tab. Change the Service Mode to Live to connect to your database. Enter your Administrate API Email Address that you created from Administrate Setup - Create an API User . Enter your Administrate API Password that you created from Administrate Setup - Create an API User . Set the Cache Time: this is how often you want your website to refresh the data from Administrate. We recommend using at least a 15 minute cache time to improve performance. Congratulations! You’ve now connected your website to Administrate! The Admin Panel for the plugin will allow you to configure several options categorised by tabs. The Welcome tab will provide instructions for upgrades and a change log outlining the changes in recent updates. The API tab includes configurations for caching, error logs allows you to toggle between Demo and Live Modes. The Courses tab outlines details and options related to the courses available, how they can be displayed and be included as part of the website navigation. The Events tab outlines details and options related to the events offered as they will appear in any of the Events widgets. The Learning Tracks tab provides details and settings for Learning Tracks that can be offered through your site. The Pricing tab will provide options related to taxes and currencies. The Registration tab outlines options related to the screen provided for students to book onto events and submit payment. The SEO tab helps provide Search Engine Optimization by allowing titles and keywords for each course. The Logs tab will provide access to logs recorded by the plugin. The Health Check tab provides a tool to identify if your site will have any issues running the Administrate plugin by checking key components such as server configuration, bandwidth and error logs. When taking a registration through your Wordpress Plugin you can have the customer's details feed into your instance of Administrate. This allows you to review them and then create a record for the customer in your CRM. By default the order details will end up in the workspace called "Website Orders (pending)" which lives under the Financial tab. On the Event’s screen in Administrate, you can define a ‘Registration Deadline.’ When set, the Registration Deadline becomes the last available date to checkout. Thereafter, the Event won’t display on your website. In absence of a Registration Deadline, WebLink will display an event based on the Event’s Learning Mode . Events with a Classroom or Blended Learning Mode will be displayed on your website up until the start date of the Event. Events with a Self-Paced (LMS) Learning Mode will be displayed on your website up until the end date of the Event. If there is no end date set for an LMS Event, the Event will be displayed on your website indefinitely. The Registration Deadline is defined in UTC and can be before - or after - the Event starts. This means you can close registration for an Event a few days early, or let clients register to an Event a few days after it has started. When set, this will show on the Event list, table and slider, in addition to the title, start date, price, etc. By default, the Registration Deadline is displayed in UTC, but this can be configured using the registration_deadline_timezone option, which is detailed in the options list for the Event Table Widget . You can display your Course Categories in your website’s menu. Create a page in WordPress that will be your main course listing page. Add whatever pages you wish to your menu, including the page you created as your course listing page. Go the “Courses” tab in the Administrate plugin. Select the page you created in the “Course Information Page” drop-down. Select what type of submenu you’d like to display in the “Course Submenu” drop-down. Warning: Only choose the “All Courses” option if you offer 10 or less courses, otherwise you may experience slow page load times. Scroll down to the bottom of the page and click the “Save Changes” button. Your custom menu on your website will now automatically display a submenu of the type you selected. When a user clicks on a link in the submenu, he/she will be taken to the appropriate course / category information page. Please contact your theme developer for support if your custom menu is not automatically displayed. You can allow your customers to register for your upcoming Events. Create a page in WordPress that will be your event registration page. Go the “Registration” tab in the Administrate plugin. Select the page you created in the “Event Registration Page” drop-down. The event registration page will now allow users to register for your upcoming events. Warning: Only enable this submenu if you have 10 or less upcoming events, otherwise you may experience slow page load times (without caching). You can display your upcoming Events in your website’s menu. Add whatever pages you wish to your menu, including the page you created as your event registration page. Your custom menu on your website will now automatically display a submenu. When a user clicks on a link in the submenu, he/she will be taken to the appropriate event registration page. Please contact your theme developer for support if your custom menu is not automatically displayed. The Category List widget will automatically display on the page you designate as your “Course Information Page” on the “Courses” tab. Note: You must define a “Course Information Page” on the “Courses” tab so that the links in the Category List widget will point to the right place. The Subcategory List widget will automatically display on the page you designate as your “Course Information Page” on the “Courses” tab. Note: You must define a “Course Information Page” on the “Courses” tab so that the links in the Subcategory List widget will point to the right place. The Category widget will automatically display on the page you designate as your “Course Information Page” on the “Courses” tab. Note: You must define a “Course Information Page” on the “Courses” tab so that the links in the Category widget will point to the right place. The show_codes attribute indicates whether course names should include their course codes. The Subcategory widget will automatically display on the page you designate as your “Course Information Page” on the “Courses” tab. Note: You must define a “Course Information Page” on the “Courses” tab so that the links in the Subcategory widget will point to the right place. The show_codes attribute indicates whether course names should include their course codes. The Course List widget will automatically display on the page you designate as your “Course Information Page” on the “Courses” tab. Note: You must define a “Course Information Page” on the “Courses” tab so that the links in the Course List widget will point to the right place. You must specify either the category or subcategory attribute. The show_codes attribute indicates whether course names should include their course codes. The Course widget will automatically display on the page you designate as your “Course Information Page” on the “Courses” tab. Note: You must define an “Event Registration Page” on the “Registration” tab so that the links in the Category widget will point to the right place. Note: You must define an “Event Registration Page” on the “Registration” tab so that the links in the Event List widget will point to the right place. show_dates indicates whether to show the event date(s). show_codes indicates whether to show the course code in front of the course title. num_months indicates how many months in the future to show. category limits the events to the specified category ID. course limits the events to the specified course code. location limits the events to the specified location name. group_by groups the events by the specified method and adds a title to each group. group_title_pre prepends the specified string to the beginning of all group titles. group_title_post appends the specified string to the end of all group titles. registration_deadline_timezone is the timezone to be used when displaying the registration deadline, which is defined in UTC in the application. Accepts either an ISO string (‘Europe/London’, ‘America/Los_Angeles’), or an offset in hours (+1, -3, +5.5). This displays 4 Events at a time within a sliding table. The Event Table widget will automatically display on the page you designate as your “Course Information Page” on the “Courses” tab. Note: You must define an “Event Registration Page” on the “Registration” tab so that the links in the Event Table widget will point to the right place. show_prices indicates whether or not to show the event prices in the table. num_months indicates how many months in the future to show by default. Note that users will be able to change the view from 1-12 months. course limits the events to the course code specified. show_categories indicates whether or not to allow the user to filter events by course category. show_names indicates whether or not to show the course names in the table. show_codes indicates whether or not to show the course codes in the table. This displays a list of Learning Tracks which can be purchased by clicking Register Now , or view further information by clicking on its name. NOTE: You must be using the new sales opportunities system to accept orders for this to work. You can turn this on or off in the ‘Registration’ tab of the administration menu. On the WordPress Administrate plugin 'Registration' tab, ensure the "Accept payment by credit card (Requires 3rd-party payment processor)" option is selected, and that the "Payment Processor" is set to PayPal. Make sure you have set “Auto Return” to “ON” within your PayPal account. Navigate to “Profile” > “My Selling Preferences”. And click “update” on the “Website Preferences” line, which may be found within the “Selling Online” section. Set auto-return to On and the return URL to your web site address. Remember to click “Save” at the bottom of the page to make these change permanent. To find the API details log in to PayPal and select “Profile” > “My Selling Preferences” from the top menu. Click “update” on the “API Access” line, which may be found within the “Selling Online” section. Select option 2 “View API Signature” to generate (or show if you have previously generated) your API credentials. Important Note: PayPal recently dropped support for testing using the Sandbox mode. This option will be removed in a future version. On the WordPress Administrate plugin settings page change allowable payment types to allow payment by credit card and ensure the online payment processor is set to SagePay. On the WordPress plugin settings page, in the Registration tab, ensure that “Accept payment by credit card” is checked and that the online payment processor is set to Stripe. On the WordPress plugin settings page, in the Registration tab, ensure that “Accept payment by credit card” is checked and that the online payment processor is set to WPM. These will be provided by WPM. When you have Events that use different currencies, your website visitors will be able to select by which currency they wish to view Events. For example, if you are a UK business but you also run Events in the US, or provide pricing in USD for online events, then your visitors will be able to filter your events by those purchasable in USD. If your Events run over multiple currencies, a drop-down menu will appear allowing to sort by currency. If your payment processor, e.g. SagePay, etc. only allows a single currency, then you may have to set up another different payment processor for the different currencies you offer payment in, or use a multi-currency payment processor. The WordPress plugin will allow you to set this up through the Pricing tab. When using multiple currencies, a payment processor must be set up for each currency, including the default currency. Courses will only be displayed if their currency is set up with a payment processor, so if you do not have the default currency linked with a payment processor, then your default currency Events will not be displayed. I made and saved changes in my Administrate WordPress Plugin, why aren’t they reflected on my website? How do I change the look and feel of the plugin screens? Can I reword anything on the generated pages? I’m an Enterprise User with multiple Companies, how do I display Events from a single Company only? Can I hide the ‘Powered By Administrate’ footer on the checkout screen because it doesn’t match my website? My WordPress site is not working properly and I have other WordPress plugins installed, could they be conflicting? I have added an event to my Administrate instance but I cannot see it in the Wordpress plugin! Then, in your browser, force a refresh of the cache. This is different from the standard reload icon or standard F5 (on a PC) shortcut. The actual command may vary between browsers and platforms, but typically on a PC this is CTRL-F5 or CMD-R on a Mac. How do I check which version of Wordpress I am using? We have plans to support other providers on a case by case basis. You can use CSS to change the look and feel of the plugin from within your WordPress theme. CSS will allow you to radically reposition elements, change colours, fonts, etc., and these changes will be saved within your WordPress theme so upgrades to the plugin won’t destroy your visual customisations. We recommend checking the plugin pages after each upgrade just to be sure we haven’t added anything that you may now need to style. 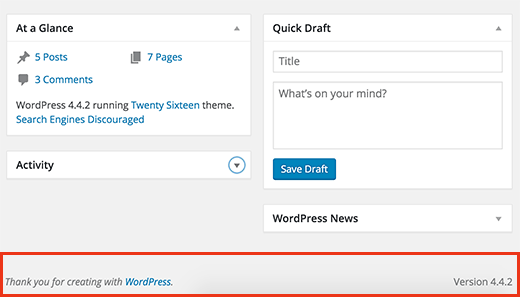 The wording of error messages can be controlled from the WordPress Administrate plugin settings page. If you want to reword the content of the templates within the 4-stage checkout process, please create your own custom template designs as detailed above. In this example, the category IDs are 54 and 55. To identify the category IDs, please check the ‘Reference’ tab of Administrate WordPress Plugin. You can hide the ‘Powered by Administrate’ footer by simply inserting the following HTML code into the same page as the Administrate Plugin. It is possible. In such situations, we advise that you disable all the other WordPress plugins, and reenable them one by one, checking your site after each change (using these steps) to whittle down which plugin is causing the issue. If you come across any plugins that you know cause an issue with the Administrate WordPress Plugin, please let us know .